Dave Pringle has been building boats since he was 14. Now, some 30 years later, he has grown his business to include the Smuggler range of seven-metre fibreglass boats, the iconic Bonito brand of smaller fibreglass boats and the Strata range of RIBs that go up to a massive 11 metres. Throughout the range he has focused on high-quality construction and finishing, simply producing the best possible product that he can. This ethos comes through clearly in the 720XS Hardtop, one of the best-finished trailer boats I've ever seen. Due to a run of bad weather resulting in tight deadlines, we arranged to meet the 720XS out on the water, so were first able to view the boat from a distance. 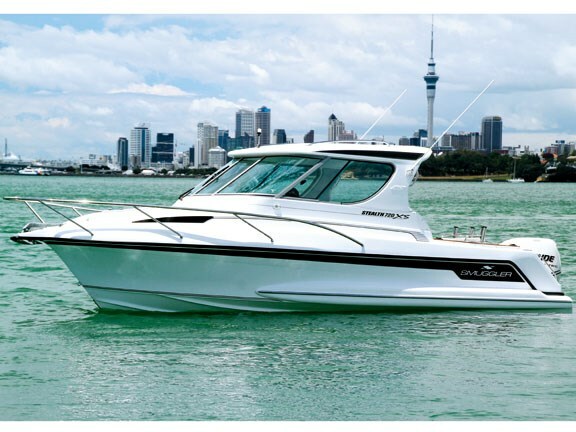 A striking brilliant-white hardtop, it is finished off with stylish black paintwork, and the white Evinrude e-Tec 225 sitting on the back nicely complements the package. 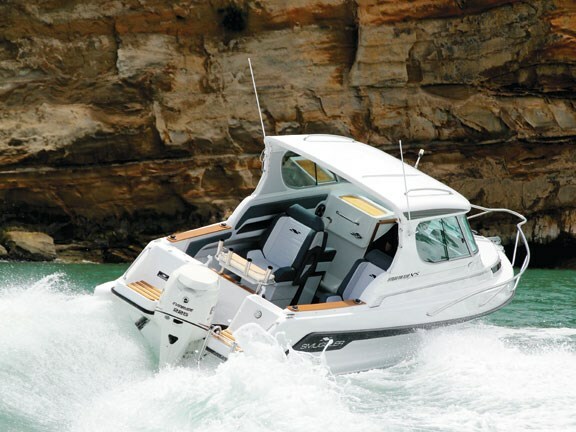 What really sets this boat apart from other hardtops in its class are the pontoons on either side of the hull. These start in line with the windscreen, and extend to the stern where they provide an additional swim step. Sitting right on the water when the boat is not moving, these pontoons enable the boat to have an extreme V (27 degrees deadrise) and yet be ultra-stable at rest. Thus, Pringle has produced a boat with the benefits of an aluminum pontoon but with the looks and comfort that only a fibreglass model can provide. After jumping on board, the first thing that was apparent was the impeccable finish. In six years of testing boats, I've never before come across a trailer boat that has such a high standard of finish. Every join, every corner, every piece of teak trim has been fitted to perfection. The grey and white vinyl upholstery and the grey carpet nicely offset the teak on the gunwales, transom and cabin, with the stainless accessories gleaming brilliantly in the sun. Going into the forward cabin we find two full-length bunks, with an infill turning these into a generous double. The squabs are luxuriously upholstered in a dark-grey fabric, none of the thin lumpy squabs that some boats have. A hinged section swings up to reveal an electric flushing toilet tucked discretely away. A mirror and two padded parcel shelves complete the interior trim, and of course the entire cabin, including roof, is carpeted. A clear polycarbonate hatch plus two side windows give plenty of light, and a sliding door (which is lockable) ensures the cabin occupants have complete privacy. Out on the bow, oversized stainless bow rails and a moulded non-slip deck surface ensure the safety of anyone working in the area. The Lewmar vertical capstan anchor winch is completely hidden under a large hatch cover, which allows full operation while the hatch is closed. Opening the hatch gives clear and easy access to the winch and chain locker, and in the unlikely event of a tangle it would be easy to sort out. The moulded bowsprit hides a stainless fairlead which holds a substantial Manson plough anchor. Back in the main cabin, it seems that this boat has almost too many features and tricks to fully describe. The helm area is offset by a carbon-fibre style trim, with the excellent Lowrance HDS7 multi-function chartplotter/fishfinder display taking up only a small part of the available space. Above that is a pair of Evinrude i-Command digital instruments, configurable to display the skipper's preference of engine information. A Cobra VHF radio and controls for the anchor windlass and the Bennett hydraulic trim tabs complete the instrumentation. The helm position is well laid out. The massive curved windscreen has a wiper on the skipper side and sliding windows on either side can open for fresh air. 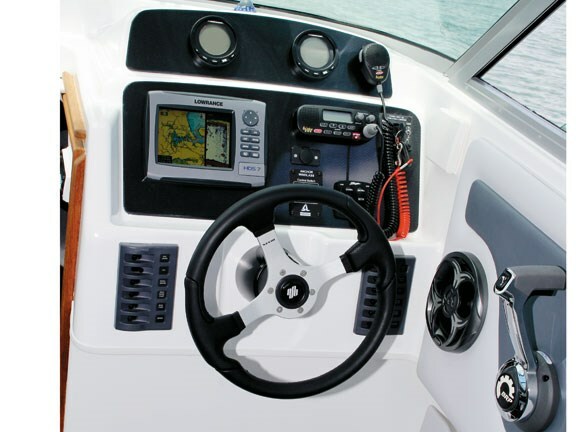 Steering is via a Uflex hydraulic system, with a luxury padded steering wheel making it easy to point the boat where you want it to go. Although the skipper seat in this configuration is not adjustable, I found it very comfortable and set to a good height. On the passenger side of the dash, a wooden insert lifts to reveal a two-burner gas cooker set into the cabin top. 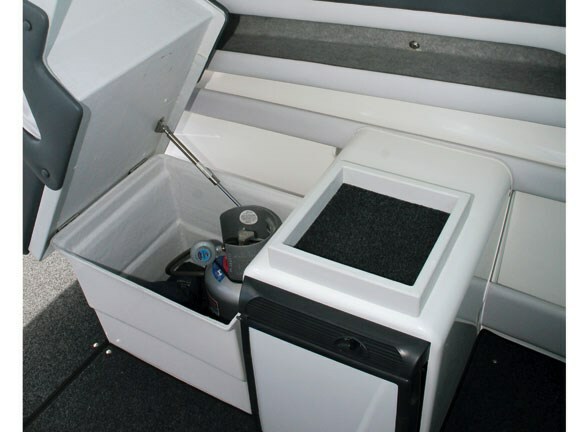 The boat features a number of Talon system sockets; two in the dash had drink holders fitted. Both skipper and passenger have moulded footrests as well as padded high-back seats which were extremely comfortable. Both sides have king-and-queen seating arrangements. The rear-facing seats are also a very comfortable vinyl-upholstered, high-back style. 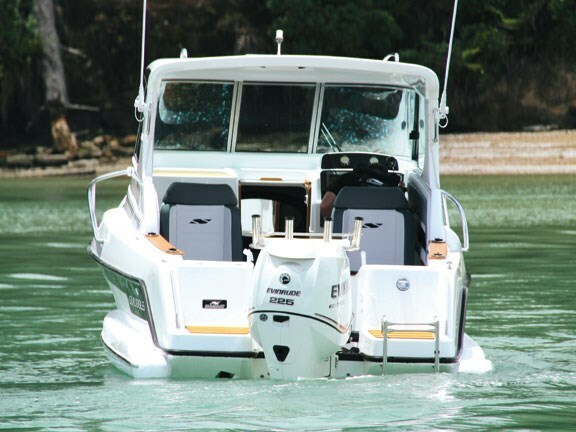 The skipper side seats swing up on a pneumatic stay to reveal a massive bin that could easily accommodate three or four dive cylinders or a couple of full gear bags. The passenger seat hides a small fridge, with a side-opening door, and also swings up to show a smaller storage bin that holds the gas cylinder. Seat pockets between the seat backs accommodate all of those necessary small items. This boat is not intended as a hard-core fishing vessel, and as a result of the large and comfortable seats, the cockpit area is slightly reduced. Other seating arrangements are available which would increase the cockpit space. Having said that, it would be possible for half a dozen people to fish off this boat and there are four rod holders set into the gunwales, with the excellent stainless and wood bait-board having four more. The gunwales are padded on the inside and have teak coamings, making them comfortable and safe for leaning against or sitting on. The fitted carpet is held in place with domes and can be removed for cleaning or when serious, get-dirty, fun is planned. The moulded floor has a non-slip texture to make it safe to walk on when wet, and a sizeable hatch (again supported when open by a stay) reveals a large underfloor compartment. Pop-up stainless cleats are in each corner of the transom, which has no step-through but two more padded seats on each side. A live bait tank is fitted into the port side transom, while teak trim adds a touch of class to the boarding platforms on either side of the engine bay. A boarding ladder on the starboard side, plus generous grab rails, make this a swim-friendly boat, with the rear edge of the pontoons being flat to provide further stepping space. Having finished our examination of the boat's features it was time to push the throttle and have a play. And what a play! The big Evinrude was very willing, and although perhaps not a quiet as a four-stroke, it still let very little noise into the cabin when going full-tilt. This hull is rated for 175 to 250hp, but the 225 seemed just right. The boat has a massive 260-litre underfloor fuel tank, and an 80-litre freshwater tank, so it is perfectly set up for extended trips. Despite the obvious weight of the boat, hole-shot performance is excellent, and the deep-V certainly provides a superb ride. It easily cuts through waves, smoothing out any rough water, and when landing it is smooth and controlled. Turns at speed are extremely controlled also, thanks to the planing strakes and the extra benefit of the pontoons. Pringle explained that when designing this boat he wanted to create something that would be forgiving of any handling mistakes, and it seems he has achieved this. We turned hard at speed, did power take-offs at full lock, crashed across wakes at full throttle and every other bad handling technique we could think of. At no time did the boat feel unsafe or behave in anything but a controlled and predictable manner. When at rest, the twin pontoons really come into play, sitting right on the water and providing exceptional stability. This stability is the reason why pontoons boats are popular, and the Smuggler 720XS is one of the very few fibreglass boats that have a rigid pontoon system, providing that same exceptional stability and safety. When the boat is planing the pontoons are clear of the water, only coming into the equation in very rough conditions, hence they have no detrimental effect on fuel consumption. We did not get a chance to see the DMW tandem trailer that the Smugger 720 XS comes on, but this is a braked multi-roller version. All-up, towing weight is 2150kg with empty tanks, so while it is a serious consideration for towing it is well within the limits of a reasonable SUV. The beam, overall, is within the legal limit of 2.4m, and the boat, as standard, has a brass keel strip, protecting the gelcoat when running up on a beach or when trailering it badly. Smuggler Marine has an absolute winner here. The boat is available with various levels of trim and I was looking at the complete bells-and-whistles package. The danger of this is that once you have seen the complete package you won't want to settle for anything less. And, if you can afford the price tag, why should you? You will not find a better boat in this class on the market. Nothing except this is too good a boat to dirty up with fish and smelly bait!